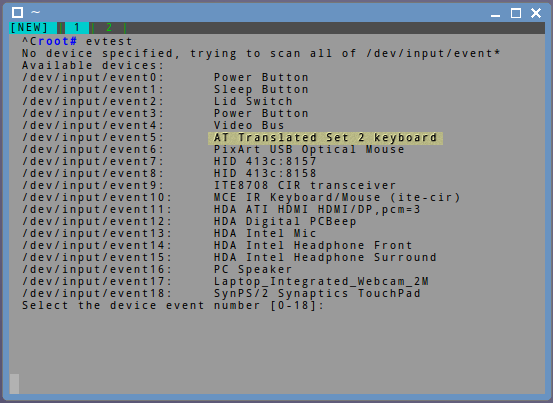 evtest can intercept keystrokes (and many others things) , all right, it's not a thief's software, but apparently it can't be very complicated to make one. so I think it's safer to use the virtual keyboard when you type a password. With Puppy you can find a tool named Florence : it's a nice Virtual Keyboard. I think it's more secure. I always use this when banking. Local virtual keyboards are no more secure than xterm's (real version) Ctrl left-mouse-press ... Secure Keyboard option. Both are circumvented by a 'reasonable' keylogger. Better if your bank has one of those drop down selections of letters from your secondary password, especially if you use a non standard window size at the time (non maximised window). Even more so if after a pristine system boot. Provide me with the same proof that evtest with a VirtualKeyboard. I don't do online banking in general as I don't use digital pay services in general as well. Also... do not use wifi for banking! If you must make online purchases, at least in the States you can purchase a pre-paid debit card from many convenience stores and pharmacies. The most you stand to loose is any balance remaining after you've made your purchase. Those prepaid cards can be emptied out to zero. If there is any money still on the card. Just use it to buy something in a store. If there is not enough money on the card. It will use what is there and show what is still needed. You pay what is not covered by the card. I only order online with prepaid cards. Thanks that's just reminded me to get some woolly puppy socks or sundries from a Marks and Spencer Christmas gift voucher. I guess they expire after a bit. But since this is the security subforum maybe a jockstrap or girdle..